Looking for career opportunities or career advice? 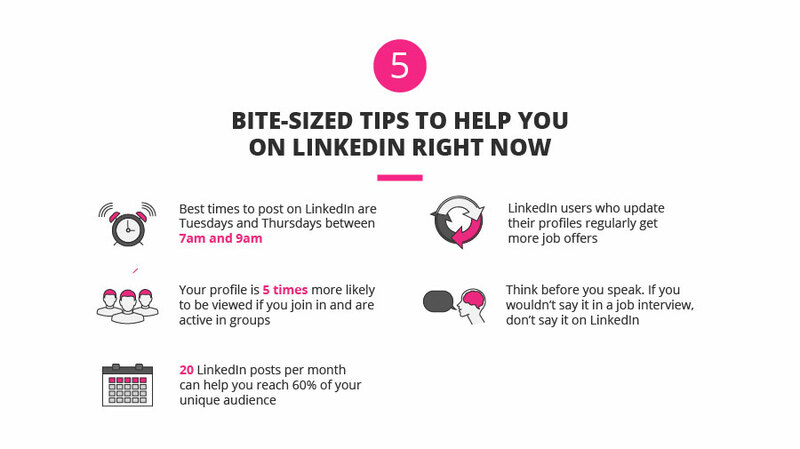 LinkedIn offers a platform where millions of professionals can form connections; it promotes your online identity in a professional manner; and it’s usually the first result that comes up in search pages, giving potential employers access to positive information about you. When selecting the appropriate headshot, consider your industry, as well as potential consumers and peers you may come into contact with, and choose an image that would make the best first impression on those people. Adding a photo to your profile makes you 36 times more likely to receive a message on LinkedIn. Who do you want to reach with your summary? What do you want them to learn or do? Tip: Adding media to your summary gives credibility to who you are and your career achievements. Include videos, slideshows, blog posts and articles. This section acts as an online resume, and is another way to support what you have said about your career experience and skill set. Use this section as a way to add more intrigue and keep people reading your profile for longer. Why should you complete your profile? This is a great way of enhancing your credibility, and building a strong network of successful connections – something which will afford you more career opportunities. Recommendations are written by other LinkedIn members who have worked with you in the past. It’s important to try get up to two recommendations for each of your most important former positions. The difference between recommendations and endorsements? Endorsements are still very important for LinkedIn’s algorithm, but these are more subtle signals of advocacy and aren’t as credible as recommendations. This is a great tool for getting exposure for your business or brand. Whenever you publish a post, your connections and followers will receive a notification about it and are often also notified about it via email. What better way to get more eyes on your LinkedIn page, and create brand awareness while doing so? If your content is really good and generates a large amount of likes, shares and comments, LinkedIn rewards you by adding it to LinkedIn Pulse – a hub of content that is highly indexed by Google and LinkedIn search. If your article is trending on LinkedIn Pulse, you can expect to receive a lot of exposure. LinkedIn users that include skills in their profiles receive on average, 13 times more profile views.